Home » All Forums » [Roadfood News & Information Forums] » Roadfood News Forum » Friday, June 7, 2013 is National Doughnut Day! Friday, June 7, 2013 is National Doughnut Day! The first Friday in June is designated as National Doughnut Day, so it's time to plan! I finally found a glazed donut I'd be willing to try. It's a Dunkin Donut donut, and it comes with an egg and bacon in the middle as a sandwich. I'm sorry but Cupcake Cafe made that list? Cupcake Cafe and no Dough or Donut Pub on the list for NYC? Mmmm... I'll have one of each, please! We need a place like that on the peninsula. 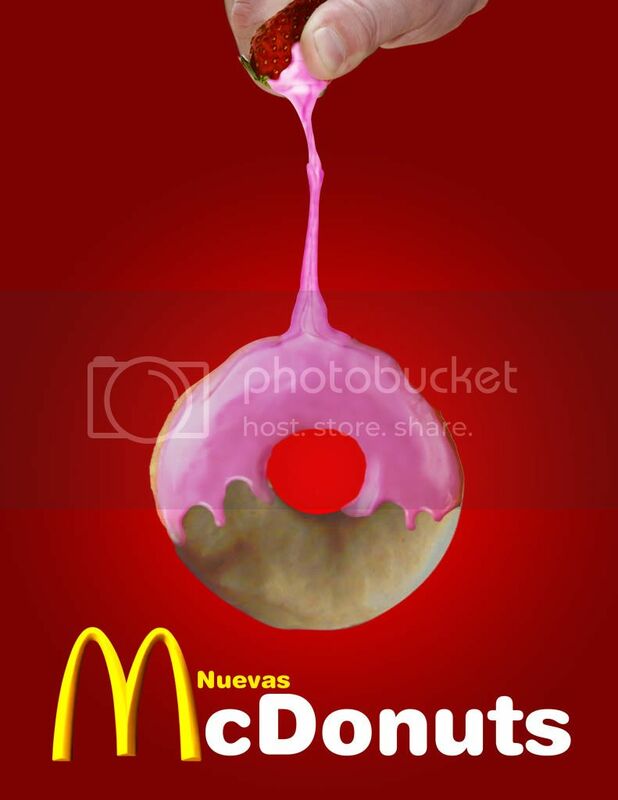 Have you tried a McDonut?? Michael - If you try it, please let us know what you think of it! Have I tried a McDonut? Of course I've tried a McDonut!!! Over here on the New Jersey side most of the donuts are good. Nothing that will make any list. So...if it rains on Friday (it will) I will have donuts in honor of the day but reserve the big tah dah celebration for when it's time to visit Pepples Donuts! Donuts that come from a farm with blueberries supplied from heaven. Heaven! Ohhh & THAT Jesus Juice happens to be Red Wine & Coke. Forgive me Jesus. I had no idea. Please still send the blueberries for the donuts. Definitely Pepples Donut Farm, which apparently has a kiosk at the Ferry Building. But if you ever want to venture over to Oakland, there's Doughnut Dolly and Donut Savant - both very popular artisanal type shops. Apparently but maybe not sooo obvious. In our defense...there were no donut corrals or hay from the farm or anything around the Ferry Building...which would have made it obvious. Nothing gets by us...twice. I'm game for all of the 457 best donuts in the Bay area. Do you know about these biscuits @ the Ferry Building? Nope. I've heard of them, but didn't know they were up there. One could just stay at the Ferry Bldg and get stuffed trying all the goodies there and never leave! In all my RV travels, the epicenter of donut shops has to be Houston. They have more than any other place I have visited. Scrumptious and Davydd - Those both look fantastic! Houston, eh?? I'll keep that in mind. I indulged my inner kid and got this. It turned out to be the lightest, most tender cake doughnut I've ever had--a total surprise. And seemingly just as many kolache shops, sometimes combined with the donuts. True that. I wonder if they have kolaches to stretch out the day. I know I generally only shop for donuts in the morning. Maybe a native Texan can explain it all. Just 4 of my Favorite Donut Places to gnosh at. operating. Everything from scratch, no dough mixs. I'm game for all of the 458 (now) best donuts in the Bay area. Wow, Cajun - I'm about speechless at those pics!! First, is that caramel donut pictured? Is it the cake one sitting on top of the coffee? Mmmmm... I fondly remember Spudnuts and keep meaning to try to make some myself, but haven't yet. That chocolate one with whipped cream oozing out looks so incredible, but whoaaaa--the sugar!!! On your and mhill's recommendations, I'll have to hit Dan-D-Donut on my next visit to the Forgotten Coast. I'm up for a Bay Area donut crawl, CC. Make a list! Yes the cake donut sitting on the starbucks cup, the donut was tender and slightly sweet, and the caramel was rich and wonderful. The round filled chocolate iced one is from DanD Donuts and it was over full, she got talking while filling it (fresh when ordered) and exploded the side, she apologized and offered another none exploded one to replace it, but I just couldnt see a good donut go to waste. DanD and Leon's are both right there in P City. Mmmm... Sorry to drift a little off topic, but I see Dan-D-Donut also has biscuits--specifically fried steak biscuits. I'd have to try one of those, too. Thanks for the tip on location and timing! Looks like Dan-D is dandy indeed. I'm using a topographical map to make this list. Found this interesting map on a page about 2011 National Doughnut Day.